There’s nothing quite like Psyche anywhere else in our solar system—a small asteroid belt object made entirely of iron-nickel metal. Which is why NASA has decided to send a probe to check out the bizarre beast up close. Measuring just 130 miles (210 kilometers) in diameter, the giant hunk of space ore known as 16 Psyche is located in our solar system’s main asteroid belt, three times further from the sun than Earth is. It’s believed to be the stripped core of a small planet destroyed in the very early days of our solar system. Visiting a world like Psyche could offer scientists a chance to learn more about the mysterious interiors of terrestrial planets, including Earth’s—which is one of the reasons NASA has decided to push forward with this somewhat offbeat mission. Another very compelling to visit Psyche: space mining. 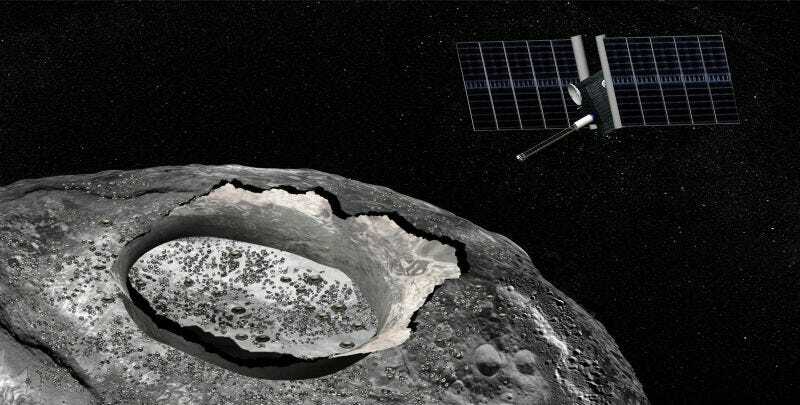 “I think one of the most important things we’ll discover are what are the surface conditions on a metal asteroid are like,” Elkins-Tanton continued, noting that Psyche’s surface could tell us a lot about how easy or difficult it would be to mine such an asteroid in the future. Psyche is one of two missions NASA has just selected, from five finalists announced last year, to receive Discovery-class funding. The other mission, called Lucy, will visit a main-belt asteroid, followed by six of the so-called Trojan asteroids located in the vicinity of Jupiter. The Trojans are a motley collection of space rocks influenced by Jupiter’s prodigious gravity, and their diverse composition is thought to hold clues to the formation of the solar system. Lucy and Psyche will launch in 2021 and 2023, respectively. Lucy will make its first asteroid rendezvous in 2025, and spend the next few years Trojan-hopping around Jupiter, using newer versions of the instruments included on NASA’s New Horizons mission to Pluto. Psyche is targeted to arrive at its metallic destination in 2030. The mission will orbit 16 Psyche for 20 months, taking images, measuring magnetic field strength and gravity, and determining the asteroid’s precise composition. Lucy and Psyche are the thirteenth and fourteenth Discovery-class missions. They follow in the footsteps of some of NASA’s most exciting recent expeditions, including the Dawn mission to Ceres, and the OSIRIS-Rex mission to asteroid Bennu.